This remote, two-mile crescent-shaped beach on Kauai where the emerald mountains meet the sparkling sea was selected No. 1 on “Dr. Beach” Stephen P. Leatherman’s 2009 list of top 10 beaches, which was released Friday. Hanalei beat out other shores stretching from San Diego to Cape Cod. Hanalei features postcard views from every angle and is untouched by the feverish development that has transformed the coastlines of other islands. It’s cherished by both locals and tourists as the perfect spot to swim, surf, snorkel or simply escape and unwind. The runner-up on Leatherman’s list was Siesta Beach in Sarasota, Fla., followed by Coopers Beach in Southampton, N.Y., on Long Island; Coronado Beach in San Diego; Hamoa Beach in Maui, Hawaii; Main Beach in East Hampton, N.Y., on Long Island; Cape Hatteras in Outer Banks, N.C.; Cape Florida State Park in Key Biscayne, Fla.; Coast Guard Beach on Cape Cod, Mass. ; and Beachwalker Park on Kiawah Island, S.C.
Leatherman based his selections on 50 criteria, including water quality and temperature, cleanliness, weather, sand, safety and facilities. And Hanalei is his personal favorite “getaway beach” in Hawaii. “If I want to get away from it all and forget about the rest of the world, Hanalei is about the best place to go, as far as I know,” he said. Hanalei is located on Kauai’s North Shore around the corner from the Napali Coast, the most stunning corner of the state. One side offers lush valleys, dramatic waterfalls and sculpted mountains with peaks that rise 4,000 feet. On the other is the Pacific, where dolphins and sea turtles can be seen. The big attraction here is that it’s not a big attraction. Unlike in the high-rise jungle of Waikiki, where thousands of glowing-pale tourists sprawl across the sand like eggs in a carton, there’s plenty of breathing room in secluded Hanalei. Newlyweds Dirk and Courtney McNealy, of Gainesville, Fla., noticed that there were only about 50 people along the entire two miles of beach on a recent weekday. “Back in Florida, it seems there’s 50 people in a 10-foot stretch,” Courtney McNealy said. The McNealys chose the so-called Garden Island for their honeymoon because they wanted a peaceful retreat. Duane Kutsch, of Richland, Wash., said he enjoyed the slower pace and the space. The flight to Kauai from Honolulu takes less than a half hour. The 30-mile drive from Lihue Airport to Hanalei, however, takes nearly an hour along two-lane Kuhio Highway. The roadway eventually runs down the mountainside and crosses a one-lane bridge before entering the tiny town of Hanalei. Egos, shoes and watches should be checked at the bridge. No one’s in a hurry in this ultra-mellow community. The village is a throwback to old Hawaii. There are sprawling plots of taro, which is used to produce poi, a staple in the Hawaiian diet. Neighborhood kids sell fresh leis on the corner. Gift shops, art galleries, surf stores and casual restaurants line the main drag. In the winter, swells and rip currents pick up in the bay and lifeguards are kept busy. Hanalei and surrounding areas have several top surf breaks. This is where three-time surfing world champion Andy Irons lives and honed his skills. Even when the surf is up, parts of the bay are protected by an outer reef, so people can still swim safely. However, visitors should be aware of conditions and posted signs and check with lifeguards. In the summer, the waters flatten out. Locals can be seen throw-net fishing, catching opelu and akule, a Native Hawaiian tradition. “There’s a good vibe overall,” said McKamey. 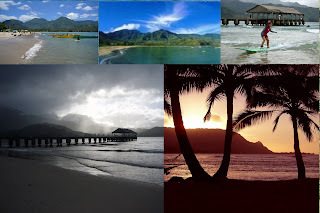 There are three parks within the bay: Black Pot, Hanalei Pavilion and Waioli. Several surfing schools offer two-hour sessions for $50-$60 and rent gear. Nestled between two rivers, Hanalei is the largest bay on the island of Kauai. Leatherman said one of his favorite views of the bay is from The St. Regis Princeville Resort, located on the bluff. The 252-room hotel reopens in October after nearly a year of renovations. More recently, the North Shore served as the backdrop in films from “Raiders of the Lost Ark” to “Tropic Thunder,” which starred part-time local resident Ben Stiller, one of many celebrities who vacation or live here. Ranked No. 2 in 2008, Hanalei will now be retired from the Dr. Beach’s list. Its selection returns the top spot to Hawaii, which has won 12 times since Leatherman started the list in 1991. Florida beaches have been named tops six times, including last year with Caladesi Island. North Carolina won once. California placed No. 4 this year with Coronado Beach but has never claimed the top spot.